The city has taken the first step towards creating more favorable conditions for redevelopment of the Brooklyn neighborhood in Downtown by beginning construction of a Regional Stormwater Management System. Plans include reconfiguring the existing retention pond located at Forest Street and Riverside Avenue to allow for development north of Riverside Avenue. This improvement will enable developers within a 45-acre area to tie into the existing system rather than creating individual ponds on each project site. Ultimately, it will reduce costs and encourage redevelopment in our downtown. The project will include a new water feature and eventually a new open space programmed for public use. Construction is expected to be completed within one year. Construction of the Laura Street Project is quickly progressing northward. The intersection at Bay Street is finished and the intersection at Forsyth Street is on track to be finished by the end of October. The Andrew Jackson statue was moved to the center of the newly constructed roundabout in July. Mayor John Peyton, City Council member Dr. Johnny Gaffney and the city’s Recreation and Community Services Department recently hosted a celebration and ribbon cutting to honor Metropolitan Park Marina’s designation as a Clean Marina by the Florida Department of Environmental Protection (FDEP). In addition to the Clean Marina designation, the City of Jacksonville unveiled several enhancements to the marina, including the addition of fire prevention equipment and upgrades to electrical services at the marina dock slips. The Florida Inland Navigation District (FIND) presented a check to the city for partial funding of the marina enhancements. The Jacksonville Landing and Downtown Vision, Inc. announced a new partnership to move the Downtown Friday Market from Hemming Plaza to The Jacksonville Landing, beginning Friday, October 1. The new market location will activate the front streetscape of The Landing and complement the city’s Laura Street Improvement Project. The market will continue to operate on Fridays from 10 a.m. to 2 p.m. Unlike the Hemming Plaza market, the new Landing location will provide vendors indoor options during inclement weather. Local company Global Greenup will manage the operation of the market. 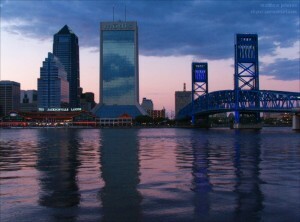 Interested vendors should contact Global Greenup at (904) 236-9966 or visit www.globalgreenup.com. Indochine, a new Thai restaurant, opened at 21 E. Adams St., above Burrito Gallery. Indochine is open for lunch Monday through Friday from 11 a.m. to 3 p.m. and dinner Tuesday through Saturday from 5 to 11 p.m.
Group 4 Design, Inc., relocated to a new office on the second floor of the Suddath Warehouse Building in Downtown (315 East Bay St., Suite 200). They celebrated with an open house in July. Visit www.g4designinc.com for company information. City Hall Pub celebrated their one year anniversary in August. The bar and restaurant is located next to Veterans Memorial Arena. Visit www.cityhallpub.com for more information. There’s an old time candy and ice cream shop in town! Sweet Pete’s opened at 1922 Pearl St. in historic Springfield. Visit www.sweetpete.net for store hours and information. This is all great news for Jacksonville! Do you have an interesting update or positive story to share? Let us know in the comments section below.